Another film that was instantly appealing to me was The Chernobyl Diaries. The same shopping spree that saw me buying The Loved Ones also saw me purchasing this! I had been meaning to watch it for quite some time and when I saw a solitary copy of it at cut price of about £5 (Thank you HMV 70% off!) I could not resist! 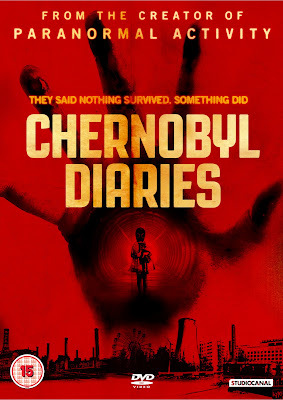 Chernobyl Diaries follows a group of friends travelling around Europe. Chris, along with his girlfriend Natalie and another friend Amanda document their trip with footage from loads of major cities around Europe. The next stop on their trip is to the Ukraine to meet up with Chris’ brother Paul. From Kiev, they plan to travel to Moscow however, a chance opportunity to visit the site of the infamous Chernobyl nuclear reactor proves too good to pass up! They meet up with extreme tour guide Uri and along with another couple there for the trip, they set off to the town of Pripyat. The actual reactor site is still too dangerous for humans so the group make do with the town that was populated by the workers and their families. 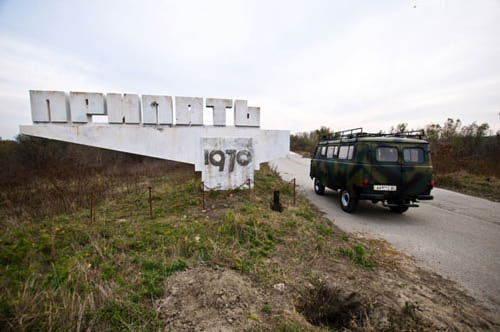 The town of Pripyat was evacuated with little warning when Chernobyl’s nuclear reactor No. 4 went critical and exploded. With the exception of a few opportunistic thieves, the town is heavily guarded and remains relatively untouched. After arriving at a military checkpoint, they are told to turn around. Uri, refusing this advice finds another route into the town through the woods. Once in Pripyat, the group are shown around by Uri who despite being slightly cautious, appears to know his way around. They take their chance to snap some very cool pics and have a good old nosey around at some of the amenities and homes that were abandoned. As day draws to a close Uri urges the group back to the van but it refuses to start. After a small bit of investigation, they find the starter motor and the cables to said motor appear to have been chewed by something! They sit less than calmly in the lifeless van until night falls around them. Then the fun really begins! With Producer and screenplay writer Oren Peli involved, we know what kind of film we’re going to get but the actual result is so much more than I had expected. It will inevitably be likened to the docu-styled paranormal activity purely because of its style but it is far superior. In fact, for reasons quite unknown to me, the more I think about it the more I enjoyed this film. The fact we are only given mouth watering snippets of the dangers, always slightly visible but just out of reach if you know what I mean. While Chernobyl Diaries wasn’t actually filmed on location for obviously reasons, I thought the scenes were very convincing. The minor details really help the atmosphere and overall believability of the movie. I know the reality of the situation is very different and people regularly visit the town of Pripyat on “official” tourist visits but if that was internationally common knowledge then perhaps the film wouldn’t have been made or maybe it would have, just set in an earlier time. A very interesting read on Sci-Fi Movie Hype takes us through some of the flaws within the film BUT what I am reviewing is the movie itself, so enjoy the read at your will but please do not let any of it take away from what is an original and fantastic horror film. Sometimes people let little things like this influence their minds too much. Example, Jurassic Park appears plausible and reachable in the film but then a Scientist tells you its IMPOSSIBLE! Does that make you enjoy the film any less? Just because tourists go to Pripyat all the time and Mobile Phones DO work, does that make this film any less enjoyable? Short answer... No! Chernobyl Diaries is brilliantly acted with a screenplay to match. Some great filming tricks make the whole thing feel ironically claustrophobic and a few jumpy bits really add to the atmosphere. At no point throughout this film did I find myself anything other than engrossed so despite everything we now know, it is still a brilliant film. In fact, I think I will watch it again tonight!